Please refer to our stock # TA10010 when inquiring. 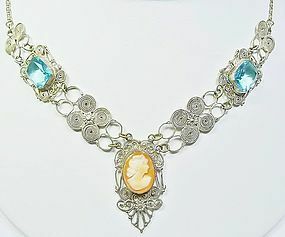 This is a very old and lovely Victorian Cameo necklace. It has two acqu glass stones on each side and the metal is Sterling silver. The necklace with chain and spring ring closure is just shy of 18" long. The cameo dangle piece is 1 1/2" long and the front decoration is 5/8" wide. The stones and cameo are all bezel set. The necklace is in good condition except that the chain could use some polishing, and it looks to me as if the spring ring closure is a replacement as it is shinier than the chain. The necklace is not marked.